1.You will get our water transfer film with the highly qualified. Material imported from Japan. cool skulls and flame, military and digital camoflauge, flags,water drop, lighting, marble,flower and cartoon design. 3.Any custom design would be welcomed. We produce for you only. 4.The max width of our water transfer film can be 120cm. 5.Royalty pattern is coming every month. 6.You can dip variety of object, cars, gun stocks and parts, motorcycles etc. Diy anything which can be into the water. powder coating material, spray guns, UV paint, printable inject water transfer blank film,speed shape and the accessories of hydrographics coating. Hydrographics Film - Water transfer printing -Cubic Coating - Blood Splatter Film Water Transfer Film. Film dimensions: 20 inches wide by 6.6 feet in length. 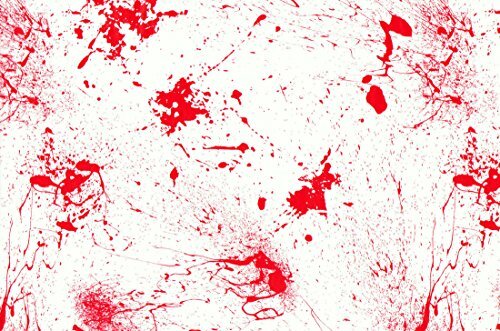 Features:Blood Splatter Film Water Transfer Film. If you have any questions about this product by Colorful Hydrographics Coating, contact us by completing and submitting the form below. If you are looking for a specif part number, please include it with your message.